iPodifier makes it a snap to turn Windows Media Center recordings into iPod- and iPhone-ready videos. After all, they're free, unlike the ones you buy from iTunes for, on average, $1.99 a pop. Sadly, Windows Media Center records in Microsoft's proprietary DVR-MS format, which is incompatible with iPods, iPhones, and, for that matter, iTunes. 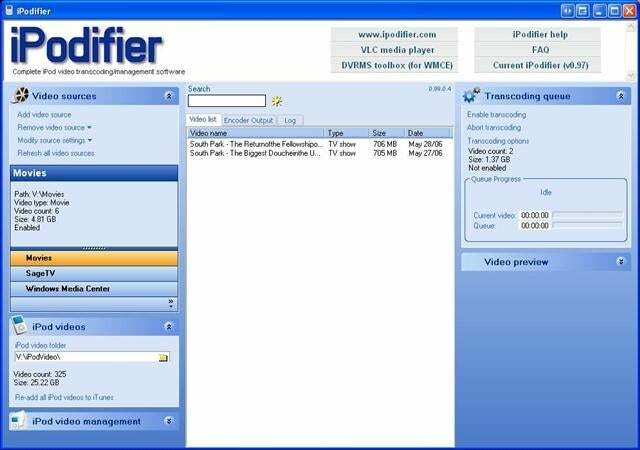 Enter iPodifier, a free utility that converts DVR-MS files to iPod-appropriate MPEG-4 or H264. Just install the program, point it to Media Center's Recorded TV folder (which is usually in the Public folder), and configure any options you want. For example, iPodifier can convert all new shows or just those you choose, and it can automatically add transcoded shows to iTunes for on-demand syncing. It's an awesome little utility, but there's one bit of bad news: It doesn't support the new WTV format used by Windows 7. Thus, it's only for users of Windows Vista and Windows XP Media Center Edition. Here's hoping the developer updates it to work with WTV files!